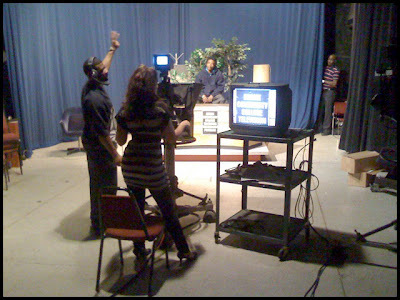 Today marked the last show for the term in my TV production class. We've done several somewhat sophisticated, timing-critical, multiple-camera setups. With Summer in the air, however, the class decided to do a "home shopping channel" style show. Fairly simple, kinda fun. It was still three-camera, but really easy. Above: iPhone snap of a runthrough.